March 24, 2016 10:00 A.M.
Ontario is moving forward with the merger of Hydro One Brampton with PowerStream, Enersource and Horizon following municipal shareholder approvals. The municipal councils for the cities of Barrie, Markham, Vaughan, Mississauga, Hamilton and St. Catharines have all voted to proceed with the merger. 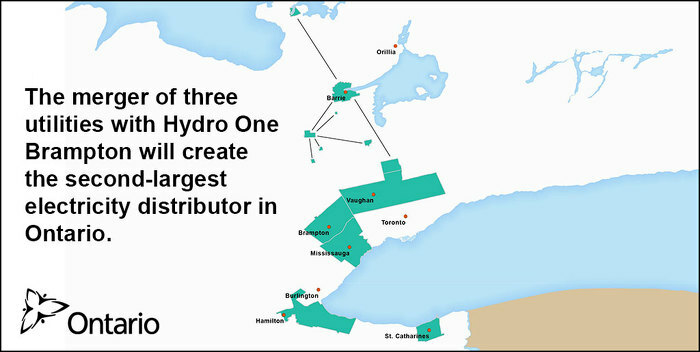 Ontario has now executed a Share Purchase Agreement with PowerStream, Enersource, and Horizon. The merger of these three utilities with Hydro One Brampton will create the second-largest electricity distributor in Ontario and allow for more efficient services and continued provision of safe, reliable electricity. The new company has also forecast a downward pressure on electricity rates of $40 per year for an average customer. This represents a major step forward in promoting Local Distribution Company consolidation in Ontario, in line with the recommendations made in the 2012 Ontario Distribution Sector Review Panel Report. The purchasers have agreed to pay $607 million for Hydro One Brampton. The transaction and creation of the new company are subject to post-closing adjustments and regulatory approval from the Ontario Energy Board, anticipated to occur in late 2016. All net revenue gains from the sale will be dedicated to the Trillium Trust to help fund investments in transit, transportation and other priority infrastructure as part of Moving Ontario Forward. Maximizing the value of provincial assets is part of the government's economic plan to build Ontario up and deliver on its number-one priority to grow the economy and create jobs. The four-part plan includes investing in talent and skills, including helping more people get and create the jobs of the future by expanding access to high-quality college and university education. The plan is making the largest investment in public infrastructure in Ontario's history and investing in a low-carbon economy driven by innovative, high-growth, export-oriented businesses. The plan is also helping working Ontarians achieve a more secure retirement. Recommendations from the 2012 Ontario Distribution Sector Review Panel Report, led by Murray Elston, Floyd Laughren, and David McFadden, concluded that LDC consolidation across Ontario could lead to an estimated $1.2 billion in savings over the first ten years. The transaction and the creation of the new company are subject to certain closing conditions, including Competition Bureau and Ontario Energy Board (OEB) approval, anticipated to occur later in 2016. The electricity rates of the merged entities will continue to be set by the independent regulator, the Ontario Energy Board. A transition plan has been developed by the new utility that ensures the continued safe and reliable delivery of electricity and customer service excellence. The new utility will be owned almost exclusively by municipal shareholders and each community will maintain a strong presence post-merger.